Is coffee really good for you? Evidence suggests that it offers a number of health benefits, provided you drink at least 2 cups per day. Alzheimer’s disease – Regular coffee consumption is associated with reduced risk of developing Alzheimer’s disease (Lindsay et al., 2002). Asthma – Drinking coffee can help to control asthma (Kirchheimer, 2005). Cancer – 2 or more cups of coffee per day can reduce the risk of colon cancer by 25% (Kirchheimer, 2005), and caffeinated coffee may reduce the risk of oral/pharyngeal and esophageal cancer (Tavani et al., 2003) and prostate cancer (Dr. Kathryn Wilson, cited on National Public Radio, 2009) as well. Cardiovascular disease – Research suggests that regular coffee consumption reduces the risk of cardiovascular disease (Kovaks, 2011; Mineharu et al., 2011). Gallstones – The likelihood of developing gallstones is significantly decreased by drinking at least 2 cups of coffee per day (Kirchheimer, 2005). Headache – Coffee cures or diminishes some types of headaches, (Kirchheimer, 2005), though in the case of migraines it may trigger rebound headaches when the caffeine wears off (Buchholz, 2002). Liver cirrhosis – The risk for this condition is reduced by 80% with the ingestion of 2 or more cups of coffee each day (Kirchheimer, 2005). Parkinson’s disease – Numerous studies have found that regular (caffeinated) coffee drinkers reduce their risk of developing Parkinson’s disease by as much as 80% (Kirchheimer, 2005). Type 2 Diabetes – A Harvard longitudinal study of 126,000 people found that 1 to 3 cups of caffeinated coffee per day can reduce the risk of developing diabetes by less than 10%, while 6 or more cups per day reduces women’s risk by 30% and men’s by 54%. Drinking decaffeinated coffee reduces the risk for diabetes by approximately half that achieved with caffeinated coffee (Kirchheimer, 2005). Some of coffee’s health benefits accrue as a result of its caffeine content, whereas others are generated by its antioxidants. The reduced risk for Parkinson’s disease and coffee’s efficacy in treating asthma and headaches are linked to caffeine (Kirchheimer, 2005). There is evidence that caffeine can benefit athletic performance by increasing endurance in the short term, so much so that the Olympic Games Committee had designated it a controlled substance until recently (Kirchheimer, 2005). The caffeine in coffee can improve concentration by increasing alertness. However, evidence suggests that it does not necessarily improve children’s academic performance as some have claimed. Higher test scores among coffee-drinking children are more likely the result of the children being more awake than enhanced cognitive abilities (Kirchheimer, 2005). Interestingly, a Brazilian study suggests that drinking small amounts of coffee with milk lowers the risk of depression among children (Kirchheimer, 2005). However, the National Institute of Mental Health found that children (aged 8-13) who had a high caffeine intake were more restless than those who did not, and 1 in 3 actually met the criteria for ADHD (Kovacs, 2011). Longitudinal studies have found a significantly lower rate of suicide among both men and women who drink 2 or more cups of coffee each day (Cromie, 1996). 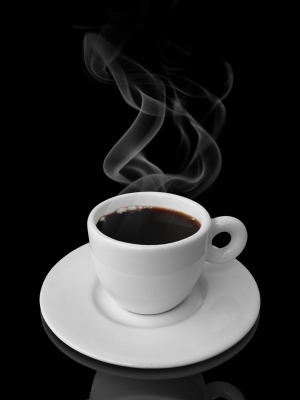 It is unclear why coffee appears to lower the suicide risk, and more research is needed. It may be that people who are depressed are less likely to drink coffee, rather than coffee protecting against depression. Coffee consumption has been linked with a number of health problems, including osteoporosis and increased cholesterol. Pregnant women, people who are prone to anxiety, and those with a family history of osteoporosis should either limit their intake or avoid coffee altogether. This article is provided for informational purposes only and is not intended to represent medical advice. If you have any concerns regarding your health or whether or not coffee could aggravate a preexisting medical condition, you should consult your doctor. Cromie, W. (March 14, 1996). “Coffee Won’t Grind You Down: May Reduce Risk of Suicide, Study Concludes.” The Harvard University Gazette. Kirchheimer, S. (Reviewed by Michael W. Smith, MD, 2005). “Coffee, the New Health Food?” WebMD. Kovacs, B., MS, RD. (Reviewed by Melissa Conrad Stöppler, MD, 2011). “Caffeine.” MedicineNet. Lindsay, J.; Laurin, D.; Verreault, R.; Hebert, R.; Helliwell, B.; Hill, G.B. ; & McDowell, I. (2002). “Risk Factors for Alzheimer’s Disease: A Prospective Analysis from the Canadian Study of Health and Aging.” American Journal of Epidemiology, 156, 445-453. Mineharu, Y.; Koizumi, A.; Wada, Y.; Iso, H.; Watanabe, Y.; Date, C.; Yamamoto, A.; Kikuchi, S.; Inaba, Y.; Toyoshima, H.; Kondo, T.; Tamakoshi, A.; & JACC study Group. (2011). “Coffee, Green Tea, Black Tea and Oolong Tea Consumption and Risk of Mortality from Cardiovascular Disease in Japanese Men and Women.” Journal of Epidemiology & Community Health, 65(3), 230-240. Tavani, A.; Bertuzzi, M.; Talamini, R.; Gallus, S.; Parpinel, M.; Franceschi, S.; Levi, F.; & La Vecchia C. (2003). “Coffee and Tea Intake and Risk of Oral, Pharyngeal and Esophageal Cancer,” Oral Oncology, 39(7), 695–700. Wilson, K., Dr., National Public Radio. (2009). “Can Coffee Lower the Risk of Prostate Cancer?” NPR.org.